I've spent my free moments in the last few weeks hurrying to make birthday presents. We bought Sadie one store bought present, the princess doll for the new movie "Brave" (one of the toddler dolls) since both girls couldn't stop ohhing and ahhing over them in the store, but I've spent any non-store sewing time coming up with birthday presents. 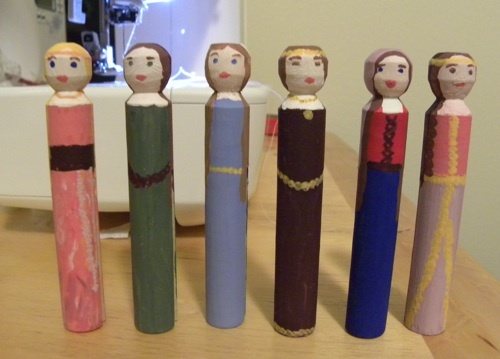 1) Saint Peg Dolls: I'm planning on making six more and then making a little fabric roll with pockets that she can carry them in. Mae Bae found the dolls and pulled them down off of a bookshelf (she's quite the climber... nothing's safe...) so I know they're a toddler hit at least. Two of them were found in the arc boat toy the girls have and the others were scattered throughout the house. Thankfully Sadie didn't see them. 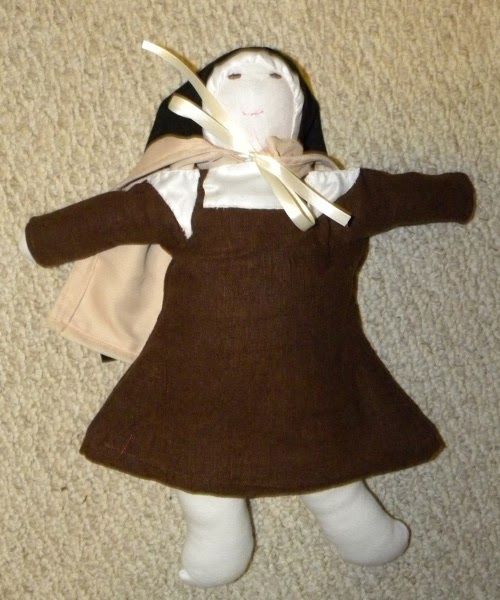 3) Saint Therese Doll: And to go with the dress a doll who's supposed to be Sadie's favorite saint. 4) The Princess Dress- Since Sadie going through a Mulan phase at the moment I made her a pink brocade dress. I have a feeling it's going to be a hit. 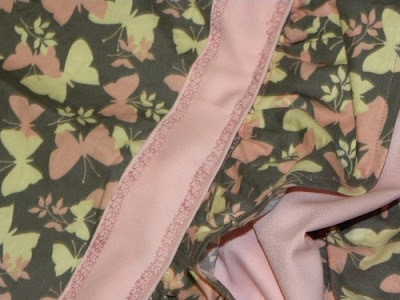 5) Apron- We forgot to bring along any of Sadie aprons, and so I took a couple of fabrics that I thought she would like and started sewing. 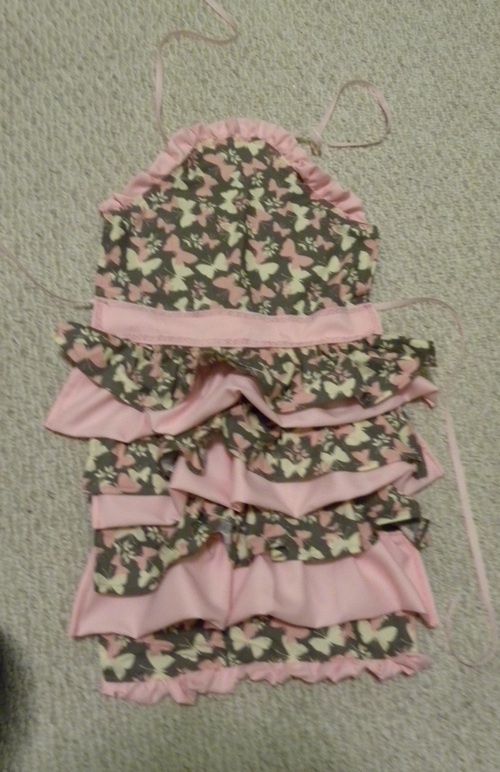 I cut the entire thing out free hand, but I think it turned out pretty well! 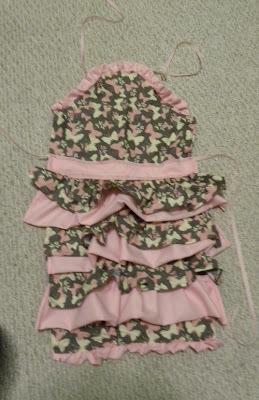 And I think Sadie's going to be excited about the ruffles! And here's a closer view of the quilting stitch I used to decorate the apron waist band and neckline. My fancy sewing machine has grown on me these past months and I've really started to appreciate it now that I've learned the tricks to make it run smoothly! Sadie turns four a week from tomorrow. I still have a little bit of crafting time left! You are very creative. :) Sewing and craft making is pretty much a lost art in our society these days, kwim? They are all very nice. You are so talented! What wonderful gifts! The peg dolls are wonderful! You could sell peg dolls in your shop, if you wanted to! 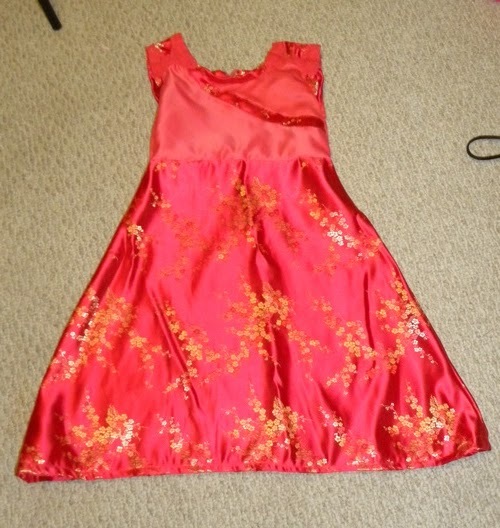 I LOVE the Mulan dress and apron! They're gorgeous! How completely delightful! Sadie is a very lucky little birthday girl! 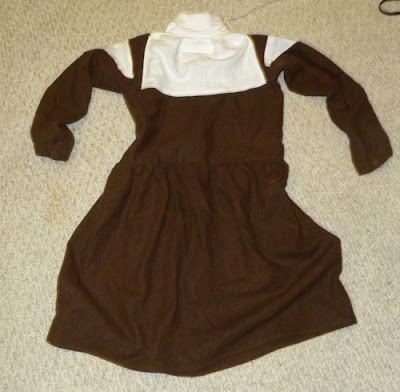 Any chance that you have a tutorial for your St. Therese outfit? My Little Flowers group will be marching in our town's Halloween parade this year and the girls want to all dress up like her. I thought I should get started!!! Yours looks great! its very beautiful gifts ideas and you create some awesome gifts. Thank you for sharing with us.